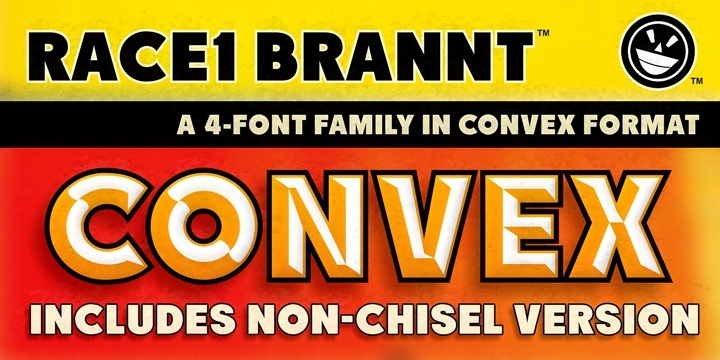 BUY NOW for $25 US and immediately download the commercial version of RACE1 BRANNT. This family comes complete with lowercase ranges, alternate characters, a layering effect to build up your colors, and BRANNT PLUS, a logoesque approach to the baseline BRANNT font. 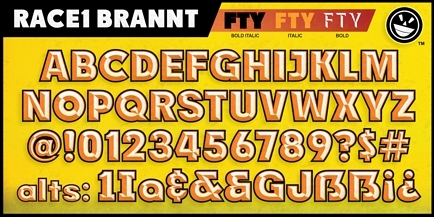 BRANNT PLUS inspires variety with its unique range of race-styled letters and numbers. 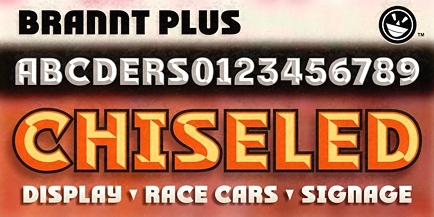 Compatible with Corel X6 interactive OpenType features. Key letters offer alternate replacements when a glyph is conspiring against your layout. To find more goodies, just visit the keymap in your design software. 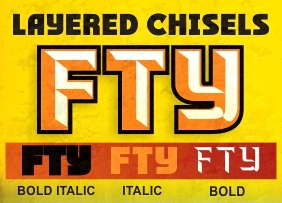 The Brannt Chiseled family downloads as a ZIP file, OTF and TTF formats included. Mac and Win support. Secure PayPal payment and PayLoadz download with email notification.